Lawn Care – Don’t Stop! Summer is over and September has arrived. Now is time to control winter and early spring weeds and grasses. Annual bluegrass, rescue grass, henbit, dandelion and many other weeds will start to germinate in September as the temperature drops and rain increases. If you wait, you’re going to have an ugly yard and you will spend more time and money to control the problem later. Pre-emergent herbicides prevent the roots from developing as the seed germinates. You must apply the pre-emergent before the end of September or it’s too late. Several brands are available to control both grassy and broadleaf weeds. Check with your local nursery or garden center. You can put the broadleaf product on the same day as the grassy pre-emergent, but do not try to mix them in the spreader. 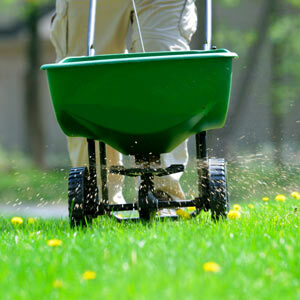 Make two passes, then water the lawn lightly to carry the granules to the soil’s surface. Watering is mandatory, don’t skip this step. If your lawn is new — less than 4 weeks from installation and you have not mowed it a minimum of three times, or you intend to over-seed with a winter grass, do not use a pre-emergent at this time. Good lawn care is always the best key to weed control. Fall fertilizer application is arguably the most important fertilization of the year. This is a time of year when your lawn can really chow down and make good use of fertilizer. The roots absorb these nutrients along with air and water. Sunlight helps turn these nutrients into carbohydrates, which are used to fuel plant processes such as maintenance and growth. Excess carbs are stored in the root system to stimulate root development during the dormant season and fuel re-growth in the spring. So don’t put your lawn on a low-carb diet. Apply a high nitrogen fertilizer or your favorite organic brand. Slow release is good but, if you are late and don’t get this done until October don’t worry you will need less nitrogen the later the application and slow release will not be necessary. Your lawn’s growth will start to slow down by late September, so nutrients go to the roots for a strong start next spring. Many people say they don’t understand why their lawn looks so bad in February. The grass is still brown but they have every weed in Texas growing six inches high. This is a true “ounce of prevention is worth a pound of cure” story.